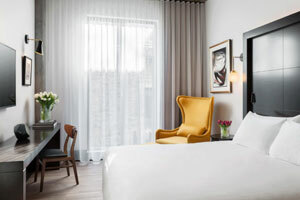 Montreal’s newest luxury boutique hotel – the Hotel William Gray – is doing what the city does best, mixing up old and modern. A glass tower sits atop two 18th-century buildings, which house 27 rooms and suites with high-end amenities inside. Other unique features include a branch of a local coffee shop, an upmarket grill, a rooftop terrace and bar, and a full service spa with outdoor pool and fitness centre (spa set to open this fall). A special “Grand Opening” offer at the hotel includes full breakfast for two, guaranteed room upgrade, two cocktails and 2 p.m. checkout.